Just listed: This beautiful used 53' Krogen Express Yacht for sale! : Atlantic Yacht & Ship, Inc.
Just listed: This beautiful used 53′ Krogen Express Yacht for sale! 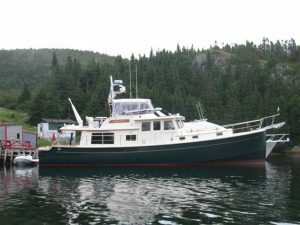 Randy Kires brings news that he has just listed great deal on a beautiful used 53′ Krogen Express yacht for sale! In the first place, this lovely used 53′ Krogen Express is known as “Shauna Leigh II”. Of course, she incorporates several design features that separate her from other Pilothouse Express Cruisers. In fact, her decks are open and accessible with complete walk-arounds. Furthermore all railings are 1.5″ high-quality stainless steel. Additionally her upper deck is open for comfortable entertaining. Similarly, the owner has incorporated additional seating for up to eight on the upper deck as well. Overall the layout and visibility from the flybridge is outstanding! This beautiful used 53′ Krogen Express yacht for sale has an extended cockpit. This offers unparalleled space in the cockpit along with additional storage below. She has benefited from numerous custom upgrades along the way as well. After all, she is one of the quiestest and smoothest running 18+ knot yachts that you will ever experience. If you are looking for an express cruiser with excellent performance you owe it to yourself to experience this one. For more information on this beautiful used 53′ Krogen Express yacht for sale be sure to contact Randy Kires today!